It was Halloween, and Pierateer RAS and TJP headed to the Punch Tavern on London’s Fleet Street to see if this Grade II listed pub can deliver some knock out pies. Nestled within the bright lights and throbbing streets of central London, this well-regarded gastropub promises to serve up freshly-prepared traditional British fare. We had pre-ordered the rabbit and chicken pies before arrival to avoid disappointment, and settled in with a gin and tonic amongst the original 1897 Punch and Judy décor to enjoy our evening. Great to see them pie-moting their top pies! Now, I would mention how delicious the sweet potato wedges were for the starter, but this is Pierate not Wedgerate so we’ll skip on over to the main course. The first pie – chicken, tarragon, white wine and wild mushroom – won 3 stars at the Great Taste Awards 2014, so we knew this was a pie we simply had to try for ourselves. 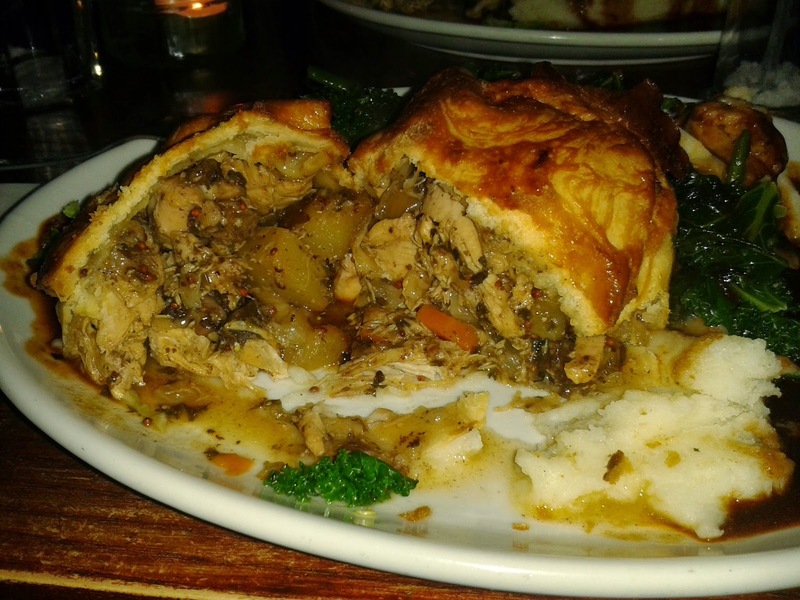 The second pie – rabbit, black pudding, wholegrain mustard, pear and cider - was an unusual filling and therefore again a pie we had to try. The little beauties arrived, and boy they looked delicious, alongside a generous portion of mash, cabbage, green beans and gravy. As rectangular pies, they were an intriguing departure from the standard circular shape. However, the condition of the pie is an important section on the Seven Cs, and we did note that both pastry casings had lost some of their structural integrity and had broken open a bit. The base and sides in places had succumbed to a mild case of gravy saturation (perhaps this was also a symptom of them resting on moist cabbage) and had thus become a bit floppy, but the lid certainly remained crisp and delicious. We must say the pastry was excellent, especially the lid which was a perfect golden brown colour. Both pies were packed to the rafters with mouth-watering content, with only a minimal air gap at the top. You might think from the outside that these pies are not that large, but inside they are a meaty tardis. 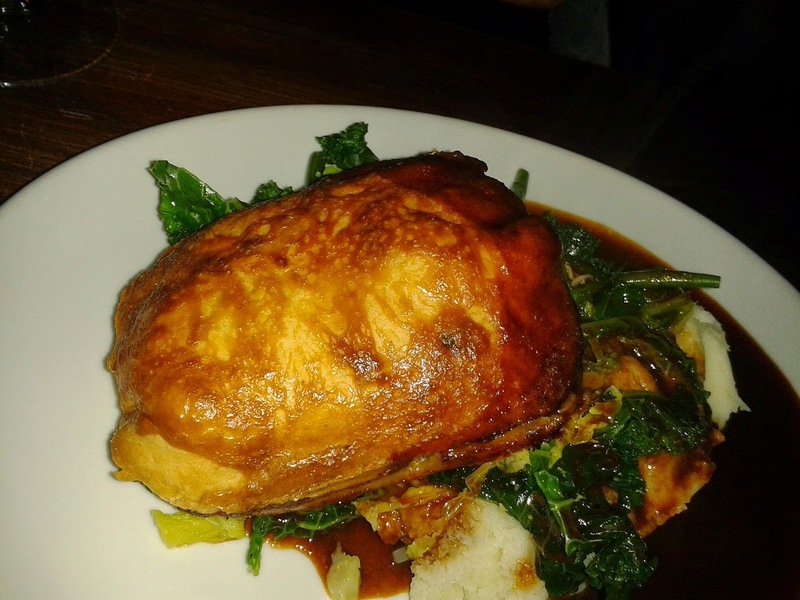 The chicken pie especially seemed to be bursting with meat, the rabbit pie slightly less so. 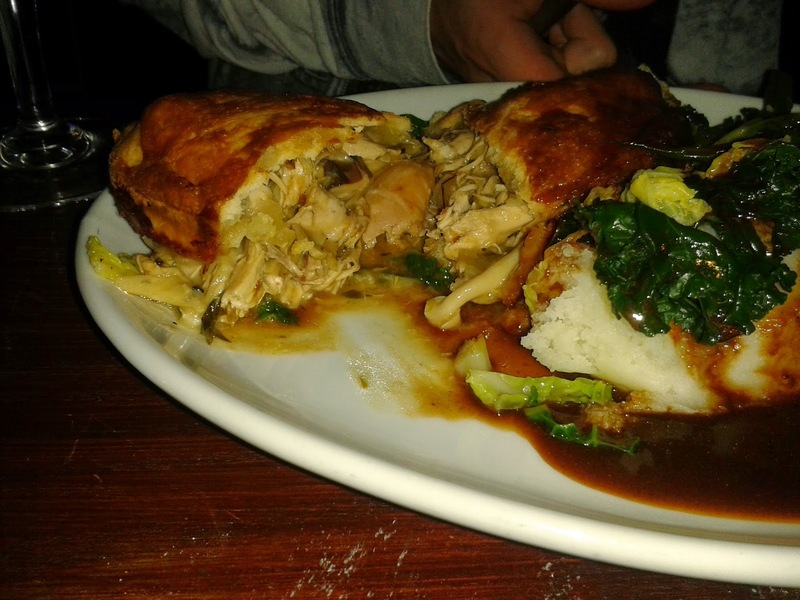 We noted that the rabbit pie had a larger proportion of what we call “filler” in between the meat chunks (we like our pies super-meaty). TJP also noted a small bone in the rabbit meat – not really a big issue at all (as it just shows this is the unprocessed real deal! ), but it does mean we have to shave off a few points as some people might find this off-putting. In the chicken pie we loved the bold taste of the tarragon; I could have eaten that filling all day, especially those wild mushrooms and the crisp flavoursome pastry lid. The meat seemed high quality and scored well for chewiness. How does it rate on cheapness? At £12.50, these aren’t the cheapest pub pies out there, but by no means the most expensive. 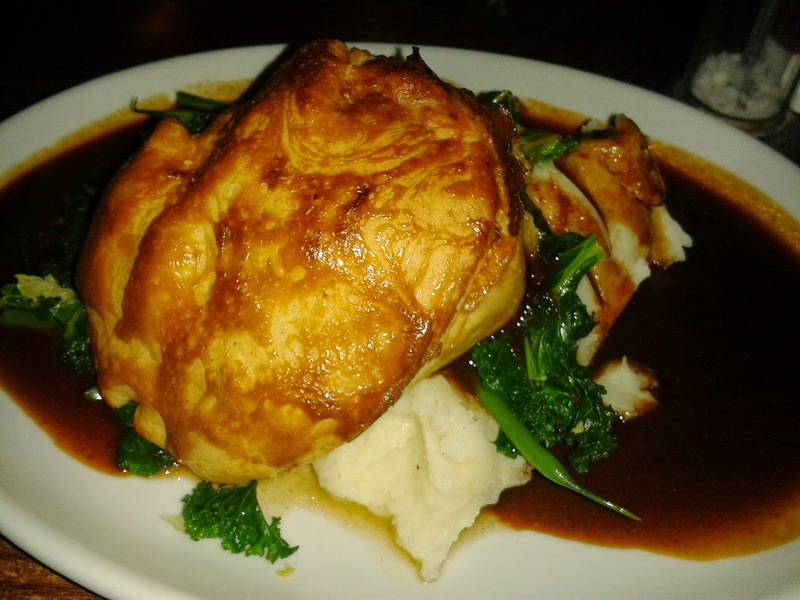 When you consider a) the location and b) the generous portions of mash and veg, we would rate the pie pretty well for cheapness. 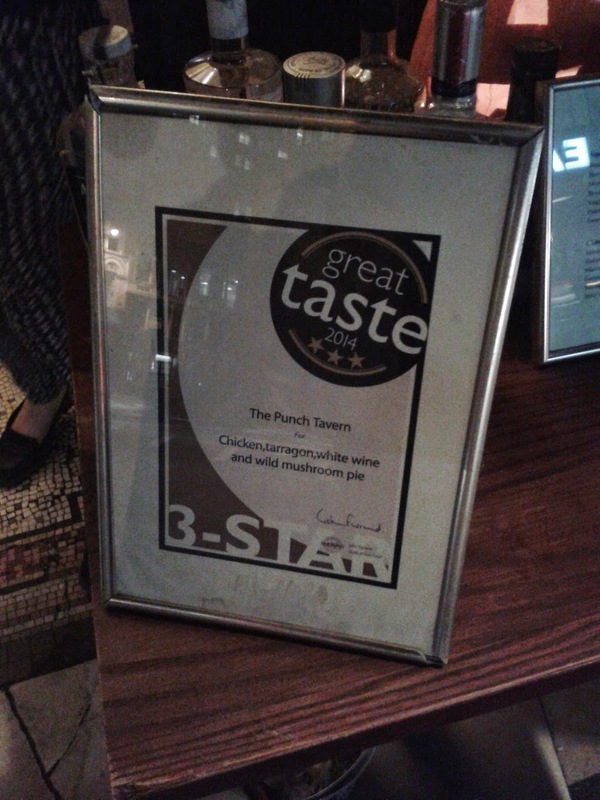 The Punch Tavern has every right to be proud of their handmade pies. There’s none of this centralised pie factory nonsense - we’re delighted to hear they craft each and every one of them themselves. Sublime pastry, tasty filling, and a freshly-prepared delight, we would definitely recommend you try both of these pies – especially the chicken pie, which comes Pierate Highly Recommended. It’s the sign of a great pie when both Pierateers are totally full and already dreaming of their next visit! These Punch Tavern pies will take some beating and they rate very highly in our 'Best Pies in London Restaurants' article!